BlackBerry | My Name Is Benwizzi, I Am A Tech Nerd. We Still Have Money to Buy These Things? A huge blanket statement right? A sweeping generalization? Well I don’t have time to go over specifics or this post would be longer than 500 words. And we don’t have time for that! The late, great George Carlin said it best; “Spending money you don’t have on things, you don’t need.” This is the greatest clip on any subject I have ever seen. Is there a need to always have the latest gadgets? This is not a competition. Contrary to what we have been told, life is not meant to be a battle or divide amongst each other. The rat race is exactly that. A race that was created by a group of people to control us and keep the status quo. It’s who has the biggest this and biggest that. If you choose to live within that matrix, then you have plenty of company. With the economy the way it is, people still tend to be buying the latest technology at a rapid pace. What recession? Ahem. If you choose to follow your own path, it may be lonely. That’s the point: it’s your own path! But that is where you attract others like you. It does happen. I struggle with it to this day. I know I am better than this and most people are. The contests for who has the best Smartphone, iPhone, Android, or BlackBerry is more prevalent than you notice. It’s become second-nature to ask, “What kind of phone is that?” We were not asking these questions until very recently. Now it’s very subconscious (or not) but there is a competition to have the biggest, baddest, most expensive. most exclusive hand-held technology there is. What is the point? When does it stop? Does having all this “stuff” make you happy? Do you feel incomplete without it? Now I understand that many of these devices have made things more convenient. As we expand and evolve, do we reach a zenith? Have we already? When does the conveniences and competition, become an inconvenience. (If that hasn’t happened already). Remember: This stuff is supposed to help us and make us feel good. Along with everything else, if it becomes a nuisance or burden, it’s time to take a break. The sad part is, a lot of the these companies are quick to make new devices, with heavier upgrades, that quickly make your previous phone become obsolete. It’s superficial and from within. You need to get the newest item so you can quickly get to 4G, 5G, whatever. Those precious few seconds of Internet loading time are too much. You can’t wait anymore. You become impatient, it becomes addicting, it’s narcotic-like. I am projecting because I was like this at one point. But I understand that I only need the basics and want to simplest way to get there. If I need a Smartphone or iPhone to do it than ok. But I am not in a race. I retired. No more. I just want peace and to be happy. And I really think that is why these toys were made in the first place. Hopefully. I will have a multitude of things to say about this at a later time. Thank you. Here we go again with some pro-Android statistics. You cannot escape the facts and numbers brought to you Nielsen. 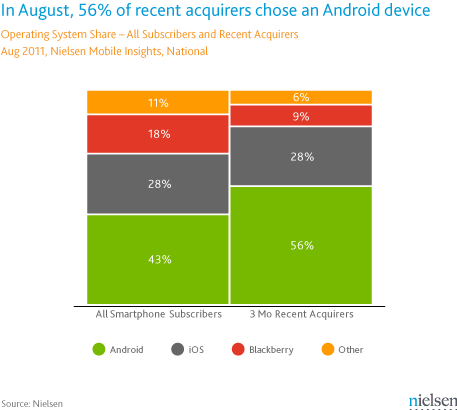 Looking at the survey of recent acquirers of operating systems, you can clearly see that Android is continuing to put it’s foot down and taking over the mobile market at 43% with 56% in the past 3 months. Blackberry seriously need to get their QNX platform on the shelves before it’s too late. For the past 3 months, they only account for 9% of recent acquirers in the past 3 months whereas they are now at 18% of overall subscribers. Clock is ticking guys and the competition isn’t letting up! iOS is staying steady with their niche market numbers. They hold 28% of the overall subscribers shares and stay at the same percentage for shares of recent acquirers. And with the introduction of a new iPhone 4S or 5 on Oct. 4th, those numbers may increase very quickly. If you’re a student or working professional that carries a USB key for whatever reason, you know how much of a nightmare it is when you misplaced that usb key on your way to that important event. Dropbox is here to save you. With Dropbox, you are able to have access to your files from almost anywhere– your pc, your phone or on their website. It now supports Windows, Mac, Linux, iPad, iPhone, Android and BlackBerry. And to top it off, it is free to sign up!! You are given 2GB free to begin using their service with different options to increase that space. 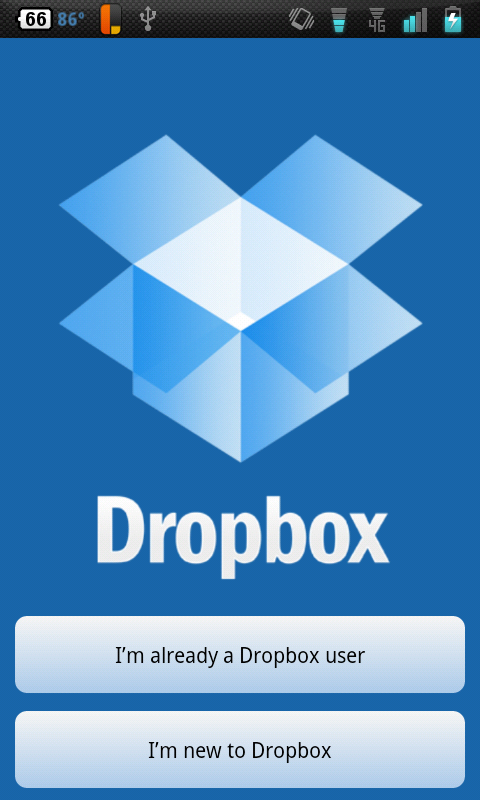 Dropbox also uses Secure Sockets Layer (SSL) and AES-256 bit encryption to protect your files. If you click here to sign up, you’ll get a gift from me of an extra 250MB of free space. Install the pc software, follow the instructions and put a few files in your Dropbox to see how it’ll work with your phone. Come on, get to it!! Now that you know what Dropbox is and you’re setup, let’s get into their Android app offering. The first time you open the Dropbox app, you’ll be greeted by welcome screen with 2 options “I’m already a Dropbox user” or “I’m new to Dropbox”. I recommend using my link up there to take advantage of the extra space.